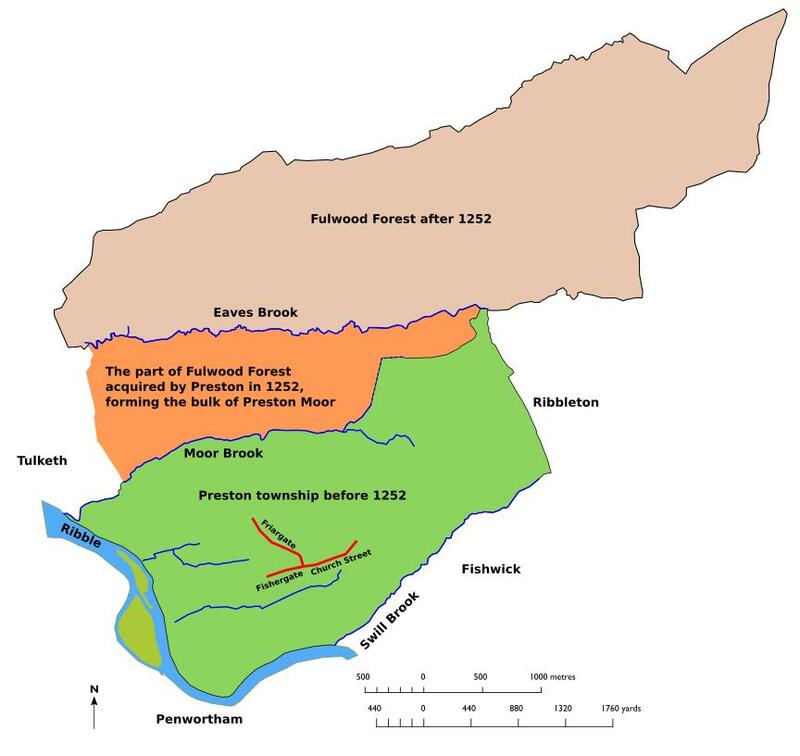 Preston had two major areas of moorland at the end of the 13th century: Preston Moor itself, of which Moor Park is the remnant, and Row Moor to the east, stretching to the Ribbleton boundary. Separating them were two estates: that of the Tyrell family stretching south from their Moor House home on what came to be named Holme Slack Lane, and the Peel Hall estate, extending from around Deepdale Brook to Ribbleton Lane. 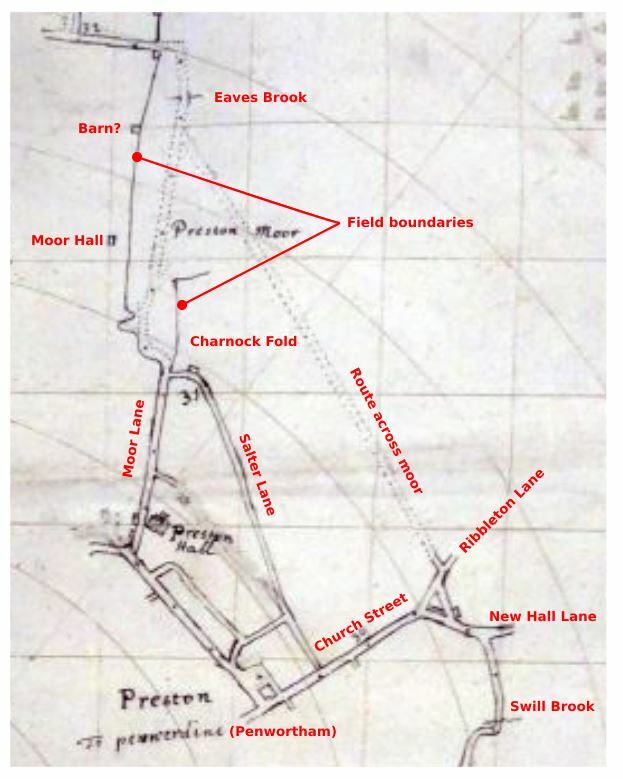 Lang’s map of 1774 shows that while by that date Row Moor had been fully enclosed Preston Moor was still awaiting extensive 19th-century enclosures. Various names attach to moorland in the Preston township. Preston Moor itself is generally referred to as simply ‘the moor’, with the eastern section south of Deepdale Brook named sometimes Peel Moor and sometimes Churchgate Moor. Other named stretches of moorland include the already mentioned Row Moor, Fulsham Moor, near to the marsh and the Hole House estate, and Suckling Moor. These names can be found in the Preston Court Leet records. The concern here is solely with Preston Moor; Row Moor and the Tyrell and Peel Hall estates are dealt with in a separate article on the land to the east of Preston Moor. 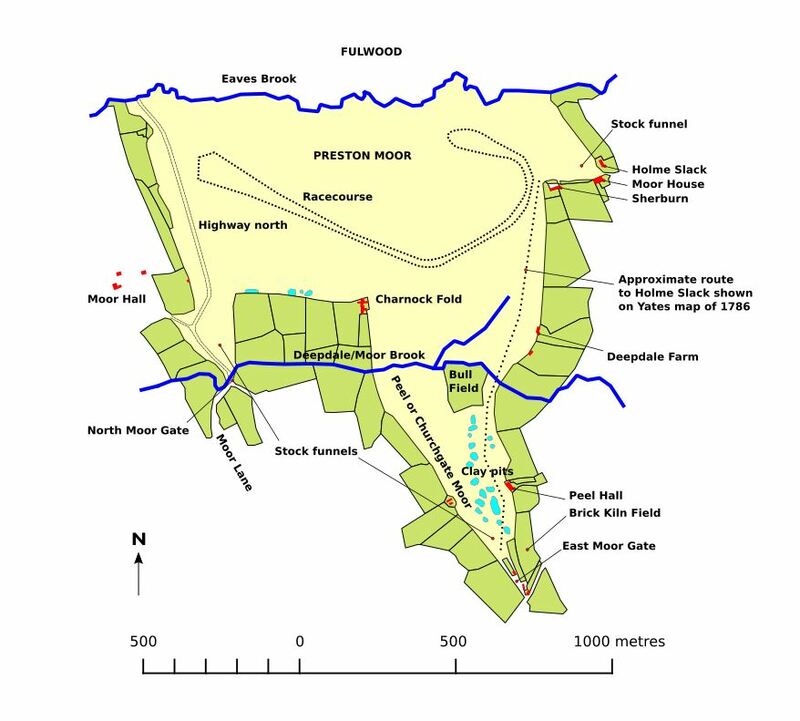 Preston Moor itself was originally a part of Fulwood Forest which was separated from the forest and granted to Preston by a charter of 1252. Before that date Preston townsfolk had various rights on that section of the forest and had been making illegal enclosures or assarts. By the charter they were given full legal ownership of the land, with the right to enclose as they pleased. It should be noted that the moorland referred to here does not signify waste, but in fact formed an integral part of the township’s agricultural economy. Atkin argues that this distinctive meaning is brought out by the Concise Scots Dictionary definition: ‘muir, moor – a tract of unenclosed uncultivated land held by a proprietor or (chiefly) a community; the common’, a description he feels better reflects the Lancashire sense of the word than the English Place Name Society’s ‘mor – a moor, originally barren waste-land’. This should not be taken to mean that the landscape of Preston Moor was ‘gentled’. It would bear very little resemblance to the Moor Park and terraced streets that have replaced it. Most notably, as late as the 18th century the now-culverted Moor Brook frequently burst its banks, flooding the main highway north; and the other paths and tracks across the moor were often rendered impassable by neglect: a frequent complaint in the court leet records (see below). Many of the roads, such as North Road and St Paul’s Road, that now cross the culverted brook are embanked high above its subterranean course. A truer indication of the barrier the brook would have originally presented to people travelling north can be seen in the steep sided valley to the east of the Moor Brook pub on North Road. The enclosure of the moor from the 13th century onwards can be traced in various property deeds. Early enclosures, notably the Moor Hall estate, stretched from the boundary with Ashton and Tulketh in the west to the line of the present Garstang Road. This latter line can clearly be seen on the first map to show the moor in any detail: one of the strip maps in the Townley Hall collection of plans, dating from the 1680s. These enclosures are considered in a separate article. Another enclosure into the moor is already hinted at on the strip map, that of the small Charnock Fold estate; this enclosure is also the subject of a separate article. Other sketch plans in the Townley Hall collection enable a more detailed reconstruction of the access to the moor from the town. A section of the strip map (DDX194/39) in the Townley Hall collection of maps and plans, added annotations in red. 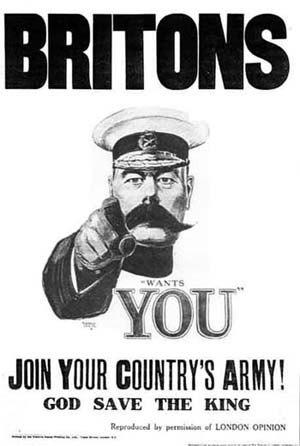 Reproduced with the permission of Lancashire Archives. The Preston Court Leet Records provide a wealth of information about the moor and the constant struggle to bar access to ‘strangers’ and curb abuses by the townsfolk. The extracts here are taken from David Berry’s transcription of all the surviving records. The records begin in October 1653 and at that date is recorded one of the perennial problems besetting those responsible for maintaining order on the moor. The jury found ‘severall p’sons have fetched sand in the Lane leadinge to the North Moor yate, and have made a great hole to the annoyance of the highway.’ Moor Lane and more especially Peel Moor to the east were frequently dug for clay and sand without permission and the resulting pits left to disfigure the landscape. The highway on the Peele moore is verie dangerous for both man and beast, by reason of digginge Clay pitts for Bricks and other service of the Towne, And in regard itt is A greate annoyance, and beinge often heretofore presented and noe redress, Wee desire all the old clay pitts may be filled upp and made eaven by people from everie house within this Towne, at the appointment of Mr. Maior and his brethren, as they in theire discretion shall thinke meete, when the weather may be convenient for the same. Noe person or persons shall hereafter digg clay nor make any pitts upon ye Moore for making Breek, without ye lycence or appoyntment of Mr. Maior or ye Bailiffs for ye tyme being, in the mose convenient place where they shall thinke fitt, neither shall they make any pitts nere the highway, where may bee dangerous for passengers with Cart and Carriage, and also shall fill upp all their pitts they have made or shall make, upon paine of every one offendinge, contrary to this pntemte to forfeit for every offence vjs. viijd. The problem persisted, for the court leet jury for February 1698/9 was presenting offenders for exactly the same offence, ‘James Bayley and Richard Myers for not filling up the Brickhill pitts upon the Moor And doe order the same to bee filld up before the twenty first of May next, On paine of thirteen shillings four pence a peece.’ And in March 1716/7 Mr Richard Whitehead was presented ‘for casting Clay on the Churchgate Moor’. The gentry were often the offenders: in the following February (1717/18) Sir Edward Stanley was presented ‘for damaging ye Moor by getting of Gravel wthout leave from ye Corporacon’. 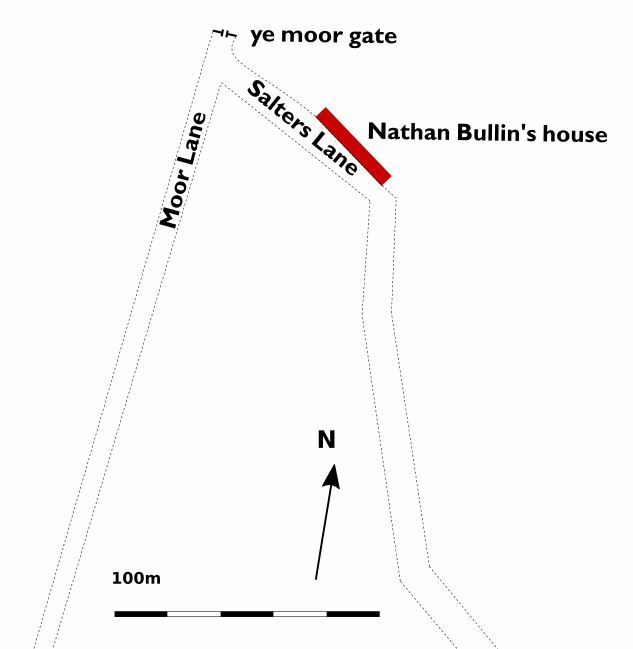 A more detailed representation of the east moor gate location, based on a reconstruction from the Townley Hall plans. The court leet records make it clear that there were two gated access points to the moor, each leading to a stock funnel. These were the north moor gate at the top of Moor Lane and the east moor gate in the present Deepdale Road. These gates were a frequent cause of concern to the townsfolk. They were frequently neglected, allowing stock, especially pigs, to stray into the town. The Swyneheards of this Towne are verie carelesse and idle and suffer mens Swyne to trespasse into Corne grass, wch is A great Annoyance, And therefore henceforth they shall keepe the Swyne further on the Moore, and not suffer them to come neare the yate, or upon complaynt made to bee disp[l]aced and punished att the discretion of Mr. Maior for the tyme beinge. And that all ownors of Swyne shall after they retume from the Moore keepe them upp, untill the Swyneheard call for them next morninge, upon paine of every one offendinge to forfeite for everie offence xijd., whereof vjd. to the Pinder and vjd. to the use of the Towne. No action seems to have been taken , for at the next court, in October, it is ordered that, ‘ye said Bayliffes shall sufficiently repaire yates at ye east moor yate and ye north=moor yate (wch are gone to decay) att or before ye 25th March next in paine of 6s. 8d.’ And problems persisted, for in October 1715 the court learned that there was no gate at Church Gate Moor and in October 1728 the bailiffs are taken to task for not repairing the north moor gate. The Bayliffes for not Calling [cauling] … the Bridge [over the Moor Brook] by the Fryergate Moor yate as also the Rampier to keep the water from overflowing the Lane by Fryer Moor yate by reason of wch the Lane being the Kings Highway is sometimes impassable for wch We do amerce them in forty shillings. Other offences reported to the court leet included stealing whins or shrubs from the moor, as in April 1695 when Richard Taylor was presented ‘for cutting and conveying away whins from off the Comon called Peele Moore without leave of Mr. Maior or Ballives and doe amerce him in Three Shillings and four pence.’ A few years later in April 1703 the fine had doubled for Evan Werden was in trouble ‘for geting Whinns upon Peele Moor without leave and amerce him in six shillings Eight pence’. Then there were problems arising from the shared grazing on the moor, as, for example, when William Southcote was presented ‘for turning a vicious Gelding on the Moor, complaint being that he Covers Mares and do amerce him in xs’. It does seem a little surprising that the horse still had an eye for the fillies despite surgery. … a considerable quantity of land south-west of Peel Hall Farm —the land now enclosed and on which the Observatory is located, and that which East View and adjoining streets cover—was of a very rough, common description, and practically waste ground. There were various depressions, forming water pits, &c., in it, and some of them were taken advantage of for domestic cleansing purposes. In the town water was scarce and dear—it was retailed at so much per canful; but the water which accumulated in the pits named was free, and “soft” in addition. Numerous Preston women went regularly to the best of them – carried house clothes, cans, pans, are, lighted ﬁres at the sides of the pits, heated water, and did their washing there as expeditiously and effectively as the circumstances permitted. Into some of the pits, not used for washing, the Preston Gas Company – then quite in the dark, like kindred bodies, as to the value of “residuals,” emptied large quantities of gas tar, the greater portion of that produced at their works, and periodically, when the pits got full, set it on ﬁre, the ﬂames arising therefrom being wildly lustrous, and forming a spectacle greatly enjoyed by local juveniles. The structural portion of Peel Hall Farm was pulled down about 1854. Lang’s map of Preston shows three immediately adjoining ﬁelds, on the north-east side of the town—now mainly covered by East View, Holstein-street, Schleswig-street, and Jutland-street, and cut through above by Meadow-street—called Cuckstool Pit Meadow, Further Cuckstcol Pit Meadow, and Cuckstool Meadow. The map does not specify any water pits in these ﬁelds; but several pits are shown, on the east side and not far from them—on land forming the south-east corner of Preston Moor. 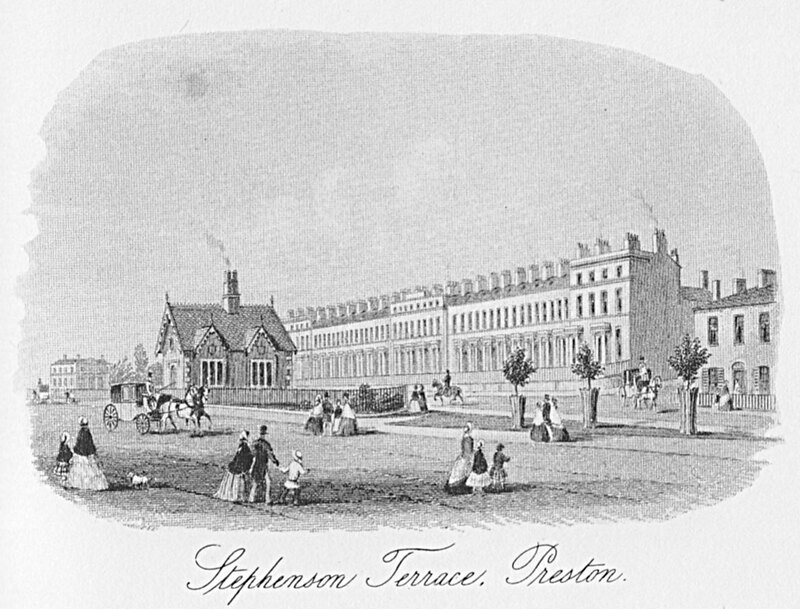 The “washinge pool,” to which reference has already been made, was one of these pits, and it would be not far from it if it were not actually the lowest of the lot, and, being so, the position of the cuckstool partially suggested in the presentment would be opposite and not far from the higher or northern half of the present Barton Terrace, Deepdale-road. A cuckstool remnant—the upright post on which the dipping plank or beam used to be worked—was visible up to about 1826, at the side of a pit between Deepdale- road and the lower end of what is now East View. Though scolds were mainly subjected to cuckstool punishment, in Preston it was prescribed as a penalty for persistently selling bread and ale defective in weight or measure, or at a wrong price. In the “ Custumal ” there is a clause which enacts that if a burgess offends against the Assize of Bread and Ale he shall for the ﬁrst, second, or third time be ﬁned 12d. ; but for a fourth offence he was to go to the cuckstool unless he paid “the best ﬁne he was able”. There is no instance on record of any local male person having been ducked. 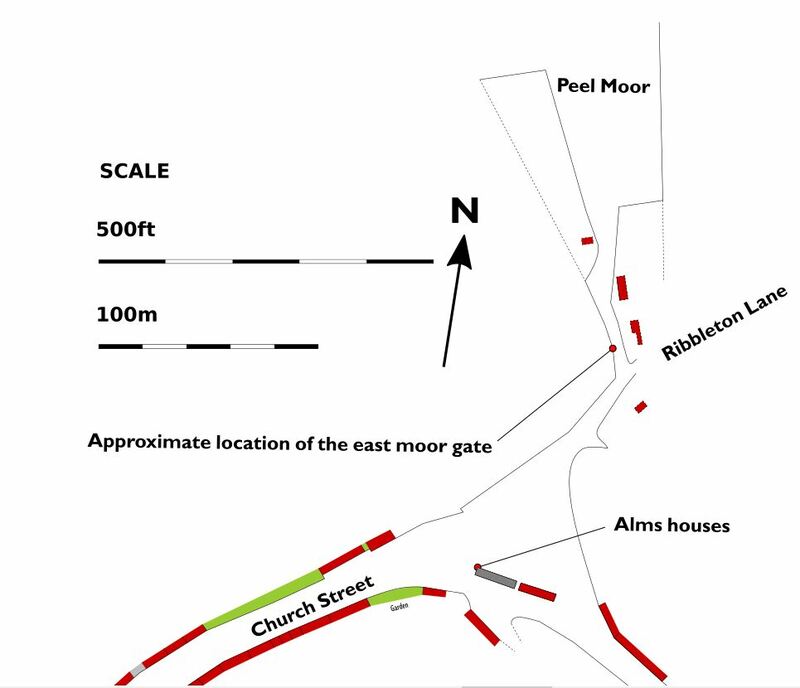 The final enclosure of the moor in the 19th century was the subject of an article by Prof Richard Hoyle in 2010. The article was described by Prof Hoyle as his ‘valediction to Preston, and to Lower Bank Road in particular’, where he lived and worked for nearly 20 years, and from where he had a clear view over Moor Park. In the article he challenges the claim that Moor Park was the world’s first municipal park. Prof Hoyle’s arguments are considered in a separate review article. M. A. Atkin, ‘Field Names and Field Shapes in NW England’, Contrebis – Journal of the Lancaster Archaeological and Historical Society 20 (1995): 20–21. ‘Fulwood to Standish – Strip Plan of Roads’, n.d., DDX194/39, Lancashire Archives. Berry, ‘Preston Court Leet Records’. Anthony Hewitson, Preston Court Leet Records: Extracts and Notes (Preston: George Toulmin & Sons, 1905), 22, 53, 194.